Buy Shetani a Coffee. ko-fi.com/shetani - Ko-fi ❤️ Where creators get paid by fans, with a 'Buy Me a Coffee' button. Hi, I'm Shetani the king cheetah! Tea is actually my hot beverage of choice. ☕ I love to fursuit at home and at conventions across the country! I post a new photo every week on Twitter and Instagram. My web series Cheetah Chat with Shetani launched on YouTube in 2018, and I'm also well known for my Pusheen Box fursuit videos. I really appreciate your support! ☕ = Shoutout! 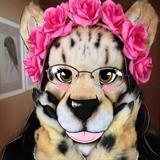 Your donation has helped fund a new episode of my YouTube series "Cheetah Chat with Shetani!" Your generosity allows me to give back to the furry community by producing educational and entertaining content, and for that, you'll get a shoutout in the next Cheetah Chat episode! ☕☕ = Fansign/tea feature! Two donations and I'll take a photo in fursuit holding a sign with your name, and tell a bit about the cup of tea you helped fund! ☕☕☕ = Fursuit doodle! Three donations and I'll attempt to draw your fursona or an animal of your choosing while in fursuit. Paws aren't the best for holding pens, so this is bound to be interesting! :3 For more perks, please check out my Patreon: http://patreon.com/jubatajan Your support helps fuel my creative endeavors, and every little bit helps. I appreciate it immensely! Secured Payments. Support goes to Shetani's account. Upgrade Shetani to a yearly Gold Membership with a one-time payment.